There has never been any significant movement in American History where a substantial legislative change occurred that did not require the people affected directly to become organized and demand better treatment for themselves. 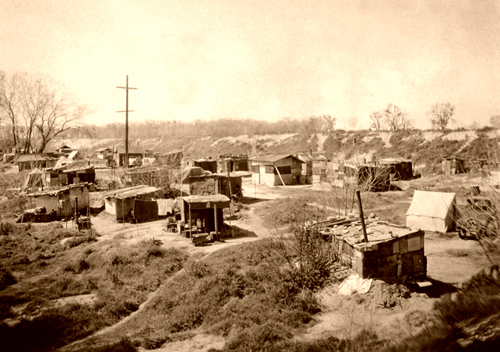 The New Deal Housing and Jobs Programs were a direct result of powerful social movements, Hooverville protests and the work of the ‘Bonus Army’ – a group of thousands of veterans and their families who built a Tent City on the National Mall in Washington D.C. and demanded access to governmental relief programs and decent housing. 36 years later, Martin Luther King’s Poor People’s Economic Human Rights Campaign sought to carry on the legacy of the Bonus Army, by building a tent city on the Washington Mall, called ‘Resurrection City’, to demand better wages and access to decent housing. After King’s assassination, momentum waned for the Poor People’s Campaign, but still, in 1968 over 3 thousand people occupied the National Mall until they were forced to leave 6 weeks later. Our naming this village ‘Resurrection Village’ is meant to honor the many who have brought us this far, and to remind ourselves that this struggle will only be won if people experiencing poverty demand justice for themselves.